Opened today in mayfair. That’s right internet. you read it here first. Not on timeout or squaremeal, but britlog. 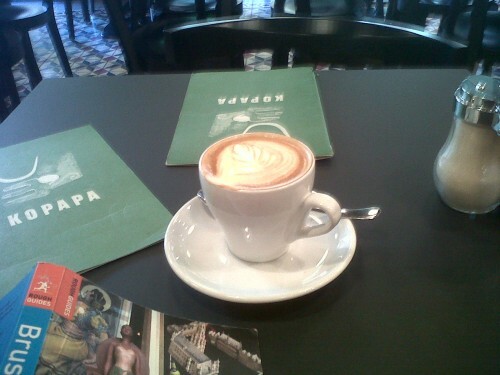 Flatwhites, latte art, aussie accents and in mayfair of all places. Sure, its like a year away. But the city is gearing up (as we’re gearing down!). 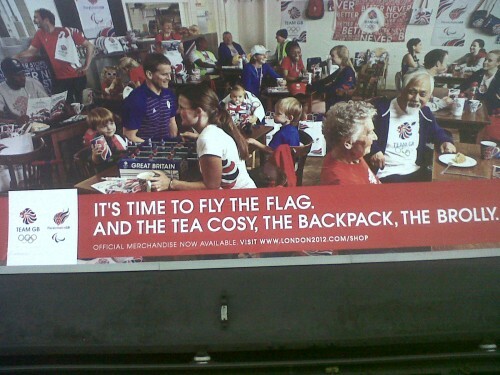 But, if you’re going to say tea cosy and brolly, should you say rucksack too? 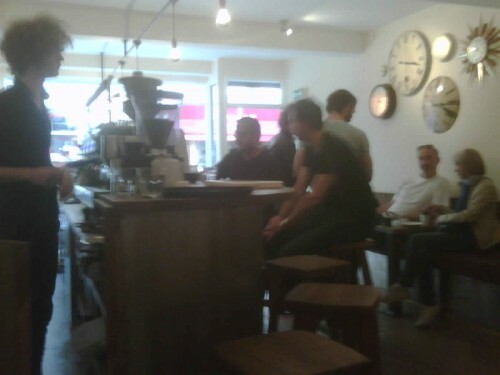 The independent coffee explosion continues in London. This place is only 2 blocks from Lantana the champion of Aussie coffee shops. I think this place is called No 26, but not totally sure. That’s just part of their try hard excentric way. Good coffee though, excellent jazz. Its hit the mainstream. 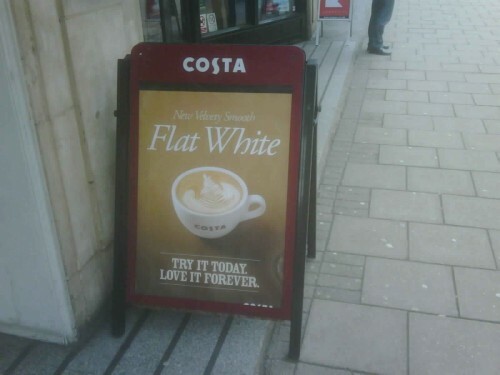 Flat whites at costa coffee?! Looks like the big chains couldn’t stand the competition from the new local coffee shops. 43min later I was asked to vacate the table. 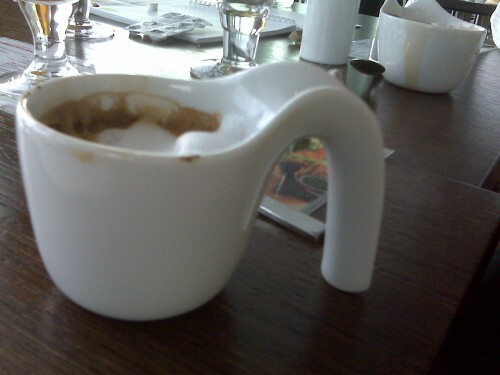 So much for lingering over a cup of coffee….. So maybe this year I should try a few other coffee shops in London. 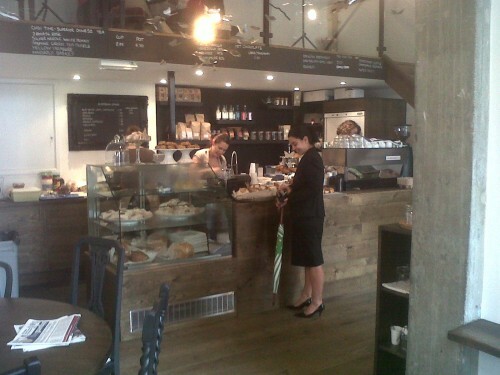 In the past 2.5 years I’ve been in here, London has seemed to experience a new love for coffee. Tea stays strong, but the love for good coffee is growing (ask any Expat and good coffee doesn’t equal costa, nero or pret) independent coffee shops have popped up all over the city. I’ve been biased to the Aussiekiwi places, probably influenced by the coworkers. But as they all seem to be heading back home, and I’m on a pure decaf diet now, its time to expand. So, here I am in bea’s of bloomsbury. British run. 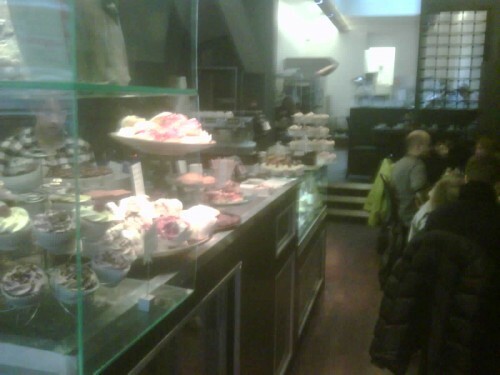 Actually more of a bakery, really, the selection of cakes is extreme. Weird thing is, all the tables are reserved! This is the first coffee shop I have ever been to that takes reservations. Forced to linger by the door for a few minutes while a table frees up I notice all the patrons are having scones and …. Tea!. Busted, my expectations on the coffee imediately drops. A few minutes later though, I’m seated (and told that I have to free the table in 45 min for the next booking). a decaf latte arrives, dressed with a pretty little fern leaf (the showy finish every good coffee place likes to do) I’m surprised. Coffee is excellent. Maybe next time I should graduate from newbie status and make a reservation. This country shuts down with the tiniest amount of snow. My train from Cambridge was delayed tonight because the “warning horn” gave due to the “inclement weather.” The bloody horn stopped working!! 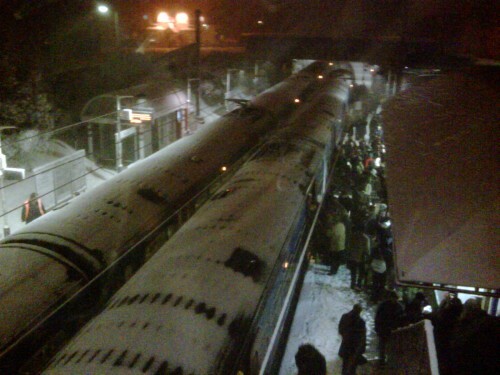 Anyhow, here’s a great photo of everyone switching trains at Royston. What are the odds we’ll make our flight to Canada in 8 hours? 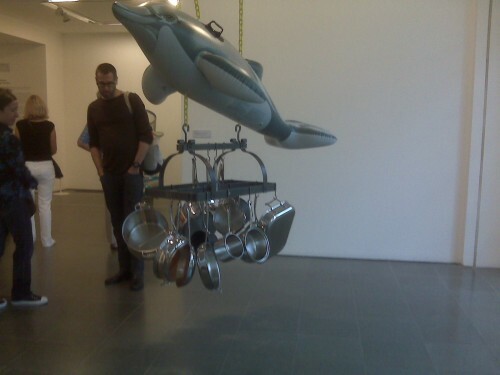 Things British people do that scare me…. Using an eye lasher curler on the tube. Twice spotted. Only a few more weeks and we’re back in London. Can’t wait!! Brit 1: ya I was once in Canada about 15 years ago and I remember someone asking me what I thought about Wayne greyzky. But I didn’lt know who that was. Me: how do you not know who Wayne greyzky is?? Me: my god! But he’s like a national hero! Hey, brit 2, do you know who Wayne getzky is? Brit2: no. Who is he? Me: my god! Only the most famous hockey player ever! Brit2: what kind of hockey? Ice hockey? Me: now you’re just taking the piss. There is hockey, and then there is field hockey and road hockey. Japanese tourists love yo sushi! I’m at yo sushi, a London sushi chain, and I’m guessing it’s not authentic at all. These tourists seem to be enjoying it, but every dish they eat, they giggle, examine it, photograph it and giggle some more. They are eating it though…. At the very least Yo is not insulting to them. Considering how often I’ve heard the Brits make reference to Jaffa Cakes I expected them to taste better. The one I had today tasted like stale bread with fake marmalade, but maybe that’s because they’re the bog-standard Sainsbury’s brand. I saw this today on my commute home through Cambridge. A crew were removing the bell from King’s College. As I was leaving a TV crew showed up. Shows you that not much interesting goes on in Cambridge! Spring has come early this year with a beautiful sunny weekend in February. Just a week after record snowfall. Though if this is anything like 2007 then this will be our summer and it will rain for the next 12 months. We had mince pies and mulled wine at work yesterday. A nice break just before the holidays. However, as good as mince pies are, I still miss Canadian butter tarts. Sigh. Welcome to the 21st Century, Cambridge! It looks like Cambridge is installing ticket barriers at the rail station. I’ve noticed the same at the “annex train shed” at King’s Cross so I guess I’ll have to get used to it. 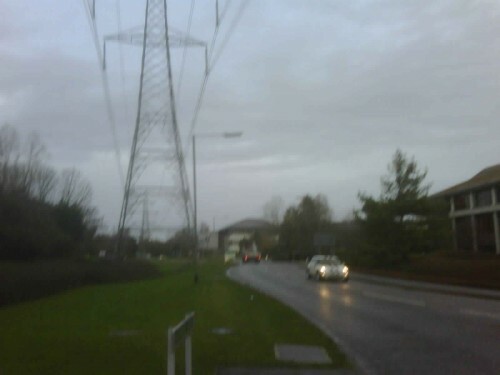 It’s going to be comical to see all the people trying to get their bicycles past these when they go into operation. I can’t wait! Ein Prosit! Ein Prosit! Der gemuetlichskeit! Ah Oktoberfest. Joy of joys. 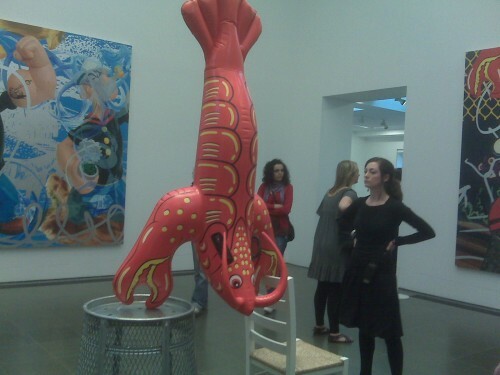 Author adminPosted on September 23, 2007 September 23, 2007 Categories As It Happens, Travel1 Comment on Ein Prosit! Ein Prosit! Der gemuetlichskeit! It’s 12 o’clock somewhere, but not here. The hall is packed but they don’t start serving beer until noon!! We’ve got a seat and we’re waiting it out. The Weisswuerste and Leberkaes should be here soon. Author adminPosted on September 22, 2007 Categories As It Happens2 Comments on Oktoberfest!! !